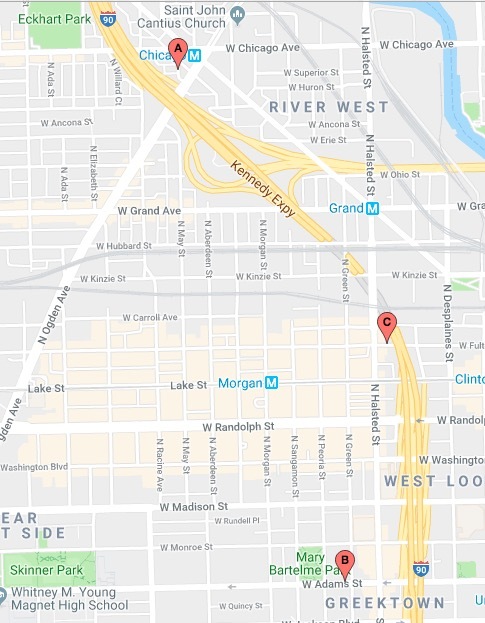 Police Thursday night warned about a carjacking pattern on surface streets along the Kennedy Expressway from River West to Fulton Market To Greektown. Detectives typically issue community alerts when they believe that a series of crimes have been committed by the same person or group. • In the 700 block of West Fulton Market on July 3rd, two men armed with handguns approached a valet driver at 6:49 p.m., battered him, took his personal property and stole the vehicle he was driving. The suspects are described as two African American men between 20- and 30-years-old. • Just after midnight on July 8th, a driver who had just parked their car in the 800 block of West Adams in Greektown was approached by five men. One of them displayed a handgun. All five offenders entered the victim’s car and drove away. One of the suspects was described as an African American man in his 20’s who stands 5’7” to 5’10” tall and weighs 150 to 170 pounds. The other four suspects were African American men in their 20’s. • Around 10:30 p.m. on July 9, a ride-hailing service driver was waiting for a fare in the 700 block of North May when two offenders approached the car. One of the men displayed a handgun and forced the driver out of their vehicle. The men then sped away southbound on Ogden Avenue with the victim's car. One offender was described as an African American male in his mid- to late teens who has an afro hairstyle. The other is an African American boy between 10- and 13-years old. In the alert, police advised people to stay aware of their surroundings, to report suspicious activity immediately, and to only park in well-lit, populated areas. Anyone with information about these crimes can contact Area Central detectives at (312) 747-8380.